Just in case you've forgotten that Maine actually has a sunny, warm season, here is a photo remedy. Courtesy of yours truly. Taken with a Holga 120 camera in the summer of 2004 at the Arundel outdoor flea market. In JULY!!! A very strange photo, no? Here's a great start to thinking about Halloween for those of us obsessed with it -- the East Coast Haunt Club is having its annual gathering in Salem (yippee!) in July. This group is made up with those who love running haunted houses, working in them, and visiting them. Anyone who has made trips down to Barrett's Haunted Mansion, Spooky World (R.I.P. ), Evilville, and HallowScream in Massachusetts will want to check this out, as Massachusetts seems to be the real center of activity in the Northeast for the most creative of these folks. Age Limit. : Ages 13 and over only please! See pictures of last year’s gathering at: www.hauntclub.net! From one Y to another! In the Portland one tonight -- & this is a bird! 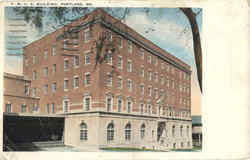 Just finished, spick and span, Georgian architecture, cheerful rooms, & solicitously courteous chap at the desk. Believe me, son, it doesn't do to knock all Y's without a hearing! Glorious day for the coach trip. Portland is not nearly as colonial as Providence, & looks just as citified, although it's only 1/3 as large. Very fascinating from its marine colour -- I went up that ancient tower (1807) shown on one of these cards, and had the maritime vista of my life! Have done the whole town and visited the colonial suburb of Stroudwater. Shall do the two Longfellow houses tomorrow -- also a visit to Yarmouth, a quaint & ancient fishing village which will form my farthest north. The White Mts. are visible from here -- had Mr. Washington pointed out to me. On Saturday I swing down to Portsmouth, Newburyport, & Haverhill. Maybe home Sunday, maybe not. It's a great life! Well, let's see... 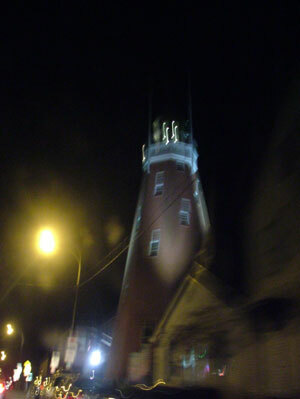 I bet the "ancient tower" is none other than the Portland Observatory (see my nighttime photo). ...and I bet he took a good gander at the Tate House and the Means House when he visited the Stroudwater area. More info on the Tate House is available at their website, but be sure to allow popups as the entire page is based on popup windows. I hope he wandered down around the East End neighborhoods on Munjoy Hill, because there are a number of very old houses that I'm sure he would have appreciated on those tree-lined hilly lanes. The current building (shown in its early glory) is being enlarged and updated in a massive spate of construction as I write. supper and social time to follow. toward our own visions of plenty, whatever they may be. pjane (AT) journalist.com. You are welcome to forward this announcement. It seems that every town in Maine has had in its history a hermit or two—men who've dropped out of society and holed up in a cave or remote hovel for a time. Some undoubtedly suffered from undiagnosed mental ailments, though the rumormongers would often imagine them the victims of unhappy romantic episodes. The Davistown Museum website offers an account of The Eccentric Hermits of Davistown—two early residents of Davistown (now Montville) who inspired an eccentric character in Ben Ames Williams' 1940 novel Come Spring. A 43-year-old man who has sculpted a home out of nearly 100 feet of rocky Kennebec River bank in the past year may be forceably evicted by police today. 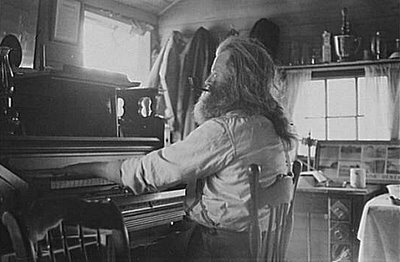 The American Memory project has four photos of the "Hermit of Maine," who in 1936 was entertaining visitors to his Freeport shack by playing on his "2 organs and one piano built together." I've started an e-mail notification for anyone who wants to be alerted when new posts appear on the site. If you are interested, just let me know (including your e-mail address, though you should type it so spam spiders can't crawl it -- put extra spaces in, or insert the letters "SPAM" in it somewhere), and I'll add you to the roster. Thanks to Chris Perridas for creating the impetus for such novel efficiency! I'm running it through Google Groups, so you can also just pop over there and sign up, and select your options for how you want to receive the alerts. beneath your feet make the bog seem an eerie place. In Maine, no human sacrifices have been uncovered, just sphagnum moss ("peat moss") for gardens and for fuel. Mining peat for fuel on a large scale may soon present a threat to some of our fragile bogs in northern Maine. Maybe Swamp Man will have something to say about that. Show up tonight at The Alehouse for a dose of his bog-stomping hard-rockin' fury when Covered In Bees play! A repost from the Maine Pagan Mailing List in case anyone is interested in celebrating the Neopagan sabbat of Imbolc. the Spring celebrations makes little sense to us winter-bound Mainers! 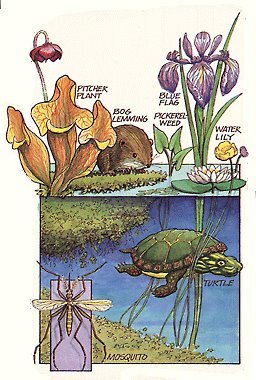 ways to move in tume with the powers of Nature. possible, please show up anyway and bring them along. moving within our personal intimate space. From the South (Buxton, Hollis, Standish) take route 35 to Windham. about 3 miles and you will come to a gift shop called Cry of the Loon. Quaker Ridge Road. Go 9/10 of a mile and turn right onto Libby Road. Go about 3/10 of a mile and turn left onto Maple Street (a dirt road). We are the first driveway on left #22 with the big green mail box. turn right onto route 35 and use the directions above. turn left onto route 35 and use the directions above. driveway on the left #22. Call 655-1211 if you need help finding us. 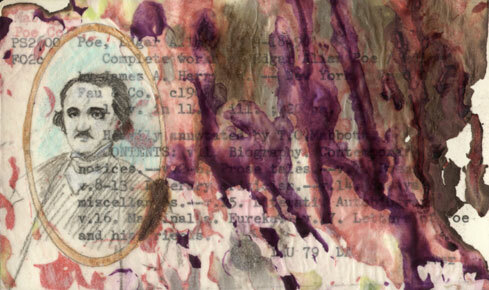 During the Civil War, the owner of a Gardiner paper mill, dangerously short on linen, got creative. Augustus Stanwood, of Stanwood & Tower paper mill on Dam. No. 5, began importing Egyptian mummies to convert their wrappings to pulp. 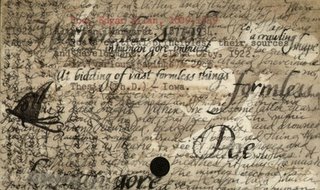 So begins Michelle Pronovost's article, "Necessity of paper was the 'mummy' of invention," published last March in Capital Weekly. Provonost looked into the story, and discovered that the Gardiner Public Library has a "vertical 'Mummy' file." The original source, it turns out, was Stanwood's own son, who further stated that the linens were not disinfected at first, leading to an outbreak of cholera among the mill workers. The Straight Dope dismisses all of this as a myth. Provonost concludes only that "if I want to prove it, I better start digging." Records of the Portland Sunday Telegram show that the mummies arrived by ship at the Portland harbor and large cases of them were then hauled by horse cart to Gardiner. There they were opened, the woven linen bindings unwound and put into vats to be reduced to pulp and made into heavy brown wrapping paper. The gums and oils used in embalming were an added value to the papermaking process. 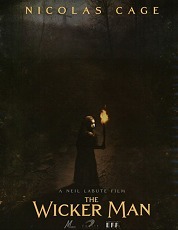 The mummies' remains were burned. Looks like the Portland (newspaper) morgue would be a good place to start digging. I just thought I'd share a project I've been working on, called cARTalog. It's based on retired card catalogs from libraries. (mmm.... anachronistic databases! my favorite.) Artists were given cards, either random or based on artist-suggested themes/subjects, and allowed to mess around with them however they wanted. To learn more about the project, and see some of the pieces recorded so far, please go to the cARTalog site here. I managed to finagle a bunch of Edgar Allan Poe cards, and came up with at least two good pieces out of the mess. I got a little wacky with these. I'm usually so boring in the processes I use and the approach I take, not much in the way of experimenting goes on, and this time I just got a lot wilder than usual. Lots of "Oh, let's see what happens when I do THIS to it!" and lighting things on fire accidentally. A mysterious black-cloaked figure, stalking into the cold. The funny part was the abject confusion into which this threw two very sozzled drunks. They had been headed in the opposite direction and got ALL turned around by the sight. Deering Oaks' pond is positively gleaming with yesterday's thaw and last night's quick freeze, resulting in a pleasant approximation of a mirrorlike finish. The skaters are all happy. So are the crows apparently, because there were a good hundred or so of them hanging out on the ice on the bridge end of the pond and on the adjoining slope. How I love thee Portland, let me count the ways!!! So windy! So warm!!! I went out tramping at lunch. Wow!!! Back Bay is green and gray with whitecaps. The seagulls are perched casually on tiny remnants of icefloes. Cutting down through the Deerfield Street area off Forest Ave, I found a gigantic old tree with a monstrous limb cracked off it, torn into the street. Nearby, a lightpost sagged into a smaller tree, uprooted from the ground, its tether snapped. Drama!!! 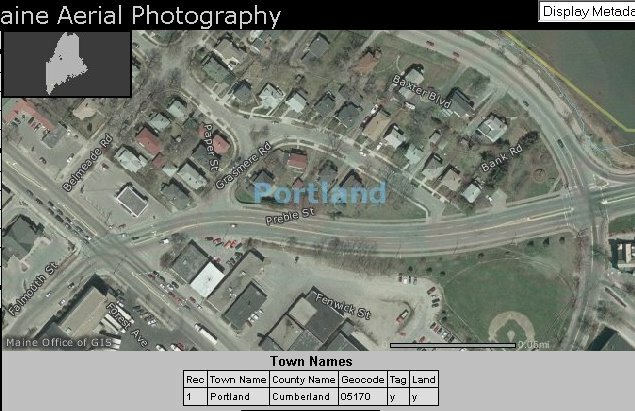 Please note the keen aerial shots, which are available on the Maine Geographic Information Systems page under their "Interactive Online Maps" menu. Yowza! 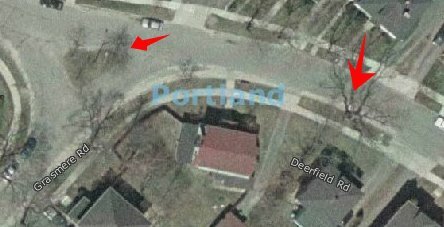 Get an overhead view right down to whose car was parked in the driveway when they did their survey. Anywhere in Maine!!! Pretty cool. I was cruising the web this morning, looking for pages with the words "freak" and "Maine" in them, and stumbled across an interesting piece of information. Ready for your pop culture trivia tidbit? Ellery Elkayem, the maker of the big budget Big Bug movie "Eight Legged Freaks," started out making smaller films, also about Big Bugs. The first was a 1997 film called LARGER THAN LIFE, which Mark Leeper describes as "a short horror film about spiders who grew to giants on toxic wastes." Leeper watched it on the Sci-Fi Channel's "Exposure" show, "and found it fun." The SECOND film is the one that concerns us, and while I've never heard of it, perhaps someone out there has. Film #2 was "about giant insects in Maine"!!! Yikes! No thanks! It's called THEY NEST (a.k.a. CREEPY CRAWLERS), and it was produced in 2002 for the good old USA Network. Bleah!! I think we have enough trouble with our mosquitos, black flies, and nasty gypsy moth and army worm coccoons. Even if it does feature Dean Stockwell as the local sheriff. Not only is he enterprising, but he is also the owner of weirdebay.com, a great idea if there ever was one. I'll be curious to see how this one turns out! A strange creature from Windham, Maine, reared its head at the Macy's Thanksgiving Day Parade. 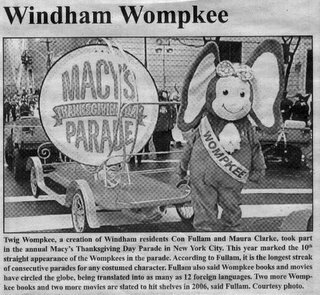 According to the Windham Independent's December 1st, 2005, issue the beastie is none other than Twig Wompkee, "a creation of Windham residents Con Fullam and Maura Clarke." More photos are available here on the Wompkee site. Apparently the Wompkee has been around for a while. How did I miss this?! 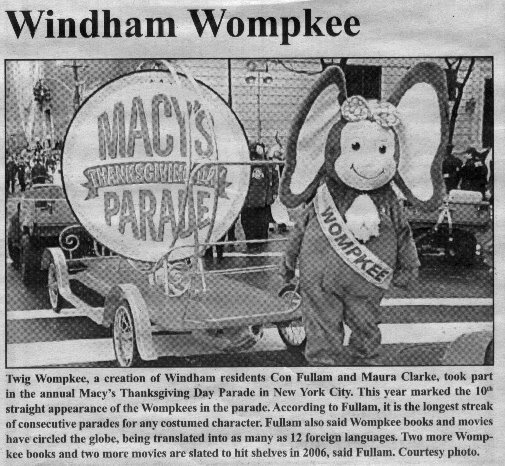 This year marked the 10th straight appearance of the Wompkees in the parade. According to Fullam, it is the longest streak of consecutive parades for any costumed character. Fullam also said Wompkee books and movies have circled the globe, being translated into as many as 12 foreign languages. Two more Wompkee books and two more movies are slated to hit shelves in 2006, said Fullam. The Wompkees appear to be fuzzy, happy, accident-prone, big-eared creatures. With the added skill of flapping their colorful ears like butterflies, and flying. And they are mostly green. If you are suffering from Christmas withdrawal, you might want to try out the Wompkee Christmas Romp. While somewhat tame, albeit with some puffball tail-waggling, the snowy backdrop just makes me imagine this is some sort of strange South Park episode. I do, however like the Wompkee snowman. For more video, including a Wompkee with an ax, please see their video page. When Augusta's Donna Kilmer arrived home on New Year's Eve, she was surprised to find two obviously belligerent assailants in a fight to the death in her front yard. They rolled on the ground, exchanging blows. Blood sprayed across her snowy front yard. The instigator was a red-tailed hawk, the victim a crow. Both survived. Surely an inauspicious start to the New Year. Vanity license plates are a pipe dream of many a car owner. Hey, for $15 extra a year you (or your friends... or your enemies) can peg your car from yards away. Amuse people. Confuse them. Or just tick them off. Heck, just pay the $15 once and then switch back to a normal plate the next year if you want to just nail it to the wall of your rumpus room. I'm always intrigued to run across a real doozy. For instance, there was a little car (mustardy in color if I recall correctly) that used to park down on Exchange Street in Portland way back when, with the license plate "FUNGI". They had pro-mushroom bumper stickers, too. Then a few years later I saw a giganto red pickup truck rattling around town with the plate "ARMPIT" -- not something I've ever forgotten, as you can see (more on "ARMPIT" later). Plates like this also make roadtrips fun. Our trip to Lake George NY a year and a half ago netted us a Jeep parked just off the road with the plate "REDRUM". Yoiks! Well, if you've ever had fantasies of a plate of your own, you can check them on the Maine government site. It's pretty cool. If the plate is available, it'll even pull up a picture of it as a sample (endless fun, here). For a long time I wanted "MACABRE" on my plate, but then I figured I should just paint it on my car (also a fantasy -- some small black muscle car, not too flashy or gassy). I think I'd probably paint it in cool, creepy-looking green letters. Maybe even throw on a few green flames for good measure. It's good that I decided on this alternate route, because someone else already owns "MACABRE," which intrigues me. Who is it??? Gah! The suspense is killing me. My roommate, who is a heavy metal maven, has the plate "BATHORY" on her red chariot. An ex-boyfriend had "INXTSKI," very appropriate to his skibum mentality. Chris W used to have "MOULTY" on her plate, and got approached about it because there was a South Portland guy with the last name Moulton who had been pursuing a collection of all the Maine license plates that had variants of his name and nicknames on them, and was going nuts because someone else had "MOULTY." Go figure! The one drawback of the Maine vanity site is that it only tells you if a plate is "unavailable." It doesn't say whether it is unavilable because it is "inappropriate" or because someone else is using it (I figured this much out by typing in "ASSH*LE", using the actual spelling, of course). So I will never know if the license plate "JERK" is actually unavailable or if it is just inacceptable to the State of Maine's sense of decency. 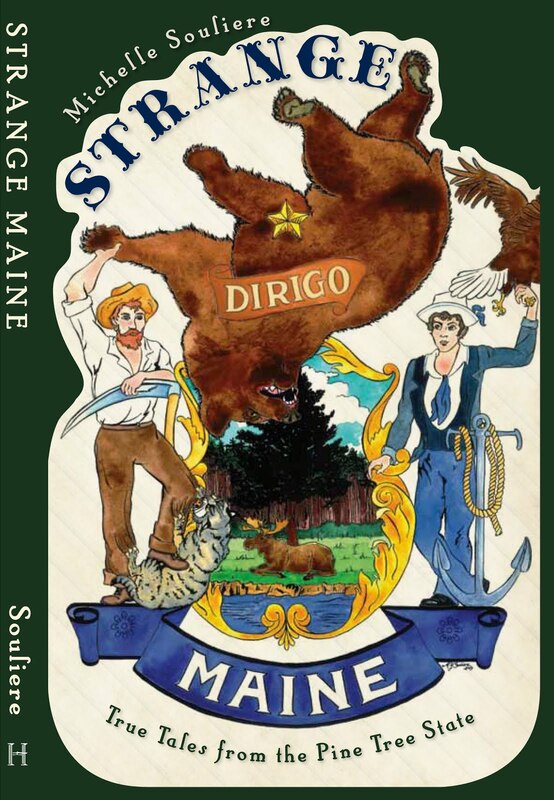 Got any Strange Maine License Plate Tales of your own? Or pictures? Let me know! Photos can be sent to msouliere(AT)meca.edu (you know where the ampersand goes). Here is Chris's story in her own words! I used to have the license plate MOULTY. Moulty was the drummer for the 60s band the Barbarians. He lost his hand in an accident and played with his drumstick strapped to a hook!! One day I was at a local park when I heard someone shout, "Hey! Do you own that car?" I turned to see a large policeman heading my way. When I stated that the car was mine, he said, "I've been trying to track you down for a long time." My heart froze in terror as I questioned what illegal thing I may have inadvertently done, or whether this was some horrible case of mistaken identity and I was about to be maimed or arrested for something I hadn't done. It turned out the cop's last name was Moulton. His family had already gotten every variation of Moulton they could think of on their license plates. 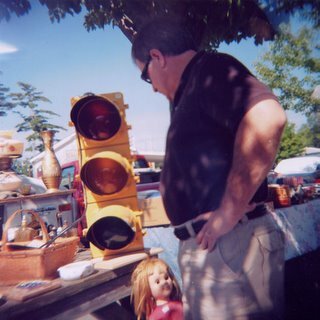 He really wanted Moulty for his daughters car, and was surprised it was taken. He checked each year to see if it was available. He was hoping he'd run into the owner so he could ask why they had chosen that for their license. This just in: the Bangor Daily News takes note of a strange dearth of pinecones this year, thanks to a reader's tipoff. I certainly didn't see any on the trees when we were up north. This was also noted last winter by a New Hampshire poster on the Farmer's Almanac Message Boards. Of course we all remember that this must mean something, but as to what it means, being so removed from our natural surroundings, we have no memory of that. I have found reference to there being a huge amount of pinecones (which is said to mean a hard winter), but no mention of a lack of pinecones. In December, a pack of Russian black squirrels attacked and killed a dog in a park in the Far East village of Lazo. Mikhail Tiyunov, a local scientist, was shocked. "If it really happened, things must be pretty bad in our forests," he added. Komosmolskaya Pravda notes that in a previous incident this autumn chipmunks terrorised cats in a part of the territory. What is going on? Oh, your children are lost, Mother Nature. Here in Maine, those of us who live near the beaches know what it's like to hotfoot it across the summer sands. 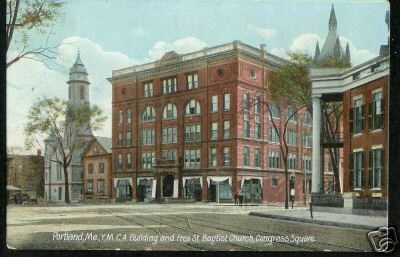 There is an interesting piece of Maine history that mentions hotter sands than any of us have had the chance to tread. In 1905, the beach and the waters surrounding Kittery Point burst into flames spontaneously. Guests at the nearby Hotel Parkfield were understandably alarmed. To quote Professor Penhallow, a botany professor who visited the scene and investigated the conflagration, "The flames were about one foot in height. They were accompanied by a loud and continuous crackling noise which could be distinctly heard one hundred yards away, while at the same time there was a very strong liberation of sulphurous acid fumes which penetrated the hotel." The events reoccurred a month later to a lesser extent. Penhallow surmised that a local earthquake that took place two days before the first eruption of flames might have dislodged organically formed gases from the beach strata where they had been trapped previously. I discovered the trail of this happening on a webpage about will-o-the-wisps at Killerplants.com, and followed it up with the more detailed account on the Maine Geological Survey pages. Neat! 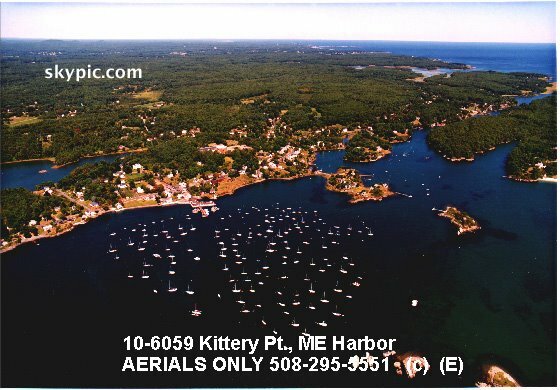 They're remaking the '70s cult classic The Wicker Man with a new setting: a "remote island off the coast of Maine." IMDb says the movie, now in post-production, stars Nicolas Cage, Leelee Sobieski, and Ellen Burstyn as head of the island's cult. Movies Online! has photographs from the set in Vancouver. Apparently shooting in Vancouver was cheaper than renting a remote island off the coast of Maine. The Astronomy Picture of the Day is a great photo of an atmospheric phenomenon... the sun pillar. This one was spotted over Bangor sometime last month.